It’s Friday night and everyone in the house is unwell. Lloyd has a serious cold, Pfennig may have what Cricket had (we have a vet appointment tomorrow), Cricket has diarrhea (super yuck), and I have allergies. Being the most well of the group, it falls to me to make a post. Wait a minute – it falls to me every time. Those lazy cats don’t ever write a thing. 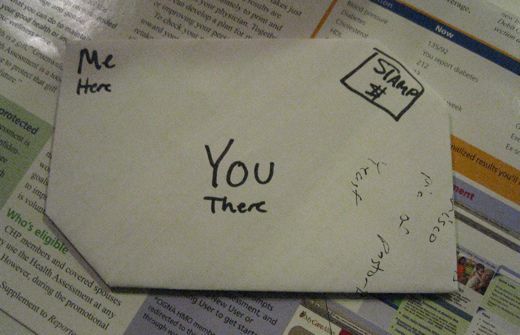 Speaking of lazy, here’s a way to save yourself an envelope! I’ve been folding up scrap paper like crazy around here. It almost makes me want to write a letter! Ha! The one thing I do even less than call people one the phone is write letters. I don’t even send out Christmas cards. Do you send out Christmas cards? I send one every year. Just one. To Angelina Jolie. Interesting. I thought MY kids were your retirement plan. Hrmph. At my address?? I just thought you didn’t know how to spell Annette! I only send out about 130 Christmas cards. I have to say it’s more of a chore than a pleasure. Maybe this year I’ll just send one … to Angelina. We send them out. Which reminds me, we’d better get started on that. Doesn’t Lloyd preach tomorrow??? Instead of spreading the Gospel, he’ll be spreading germs.